Added on June 23, 2015 by Kavi Guppta. We share a lot of insights on this blog about the importance of building an invention space within a company. But how exactly do you create that space? The ideal approach is to have your team testing and interacting with customers immediately. In this post, I outline two very simple tweaks to actions your team already performs that can focus their efforts around experiments and generate evidence for their ideas. Before I dive into my two examples, I want to point out that not all actions within a company are bad. What teams should really avoid is “intellectual masturbation”--tasks that feel like actions, but rarely display tangible progress to validate or invalidate ideas. For example, the common approach would be to set up a frenzy of meetings; bring in consultants; and host a lot of brainstorms and discussions. These actions may encourage your team to communicate their assumptions, but they won’t get your team into the field and in front of customers to test their guesses. 1. Don't brainstorm around ideas. Brainstorm around testable hypotheses. The next time your team has a brainstorm session, get everyone to post up a testable hypothesis for the problem being discussed. What does that mean? Instead of spending time talking about good ideas and picking one to implement, the team will have a series of experiments to conduct to quickly and cheaply gather evidence for their assumptions. What needs to be true for the ideas to work? How are they going to test if that hypothesis is true or false? What are they going to measure to validate or invalidate the hypothesis? Let’s say traffic around your landing page has dipped over the past few weeks. What are some quick and cheap experiments the team can run to increase traffic immediately? What will they measure to observe if their hypothesis was correct? Did the team’s experiment uncover other interesting behaviours? Maybe customer traffic increased, but the experiment also helped to generate new email subscribers. 2. Don't immediately draft a business plan. Run a portfolio of experiments. Your wall is now covered in plenty of testable hypotheses. The natural next step would be to write up a business plan. Rather than wasting time and resources on a plan with no evidence, your team must instead run a portfolio of experiments to validate or invalidate their assumptions. Why? It’s far too early for a business plan. The business plan is a great tool for execution; but at this stage of testing, your team will be getting granular too quickly. 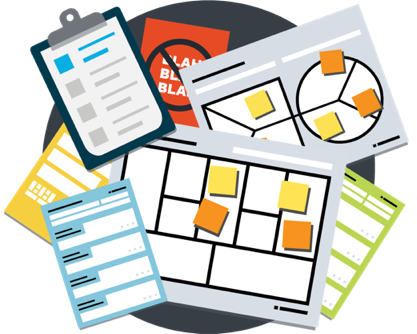 A collection of active experiments will allow your team to gradually evolve their ideas and collect evidence for their assumptions. These experiments will help your team reduce risk and uncertainty around their hypotheses through real market feedback. Once your team sees a potential hypothesis worth scaling, only then will a business plan be a powerful tool for larger implementation of an idea. What are some ways your team can build a portfolio of tests? They can conduct interviews with customers to gather relevant insights. They can create potential value propositions directly with customers through these two exercises. They can run a set of A/B tests on alternative versions of your product or service. Make sure your team captures their insights into actionable learnings to iterate and continue testing. The Test Card and Learning Card will help you organize your experiments and customer learning. Get access to both tools in our Resource Library. Simply create an account, it only take a moment.